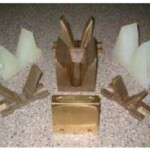 Tank Hand Magnets - Allied Plating Supplies, Inc. These powerful magnets allow you to safely recover iron or steel parts from tanks, plating barrels or saw dust. They quickly retrieve parts clinging to corners or surfaces of plating barrels. Each unit comes in a standard 48” overall length with a corrosion resistant, plastisol coated handle.